Another busy week, and we’re only half way through! I had a fantastic weekend at the Falconry Centre, the highlight for me was flying Sam, the Harris Hawk, twice on my own (under the watchful eye of Lon). I had LOTS of practice using the one-handed falconry knot, and enjoyed plenty of close encounters with the birds during cleaning & feeding! We had some very keen visitors in the Owl Encounter, and thankfully most of the owls were on their best behaviour..all bar Woolley who, being in mid breeding season was intent on luring us to his ‘nest’ so we could lay him an egg! He wasn’t interested in flying, so he went back to his aviary and his fellow friends were brought out to entertain the visitors instead. A big thumbs up to George, Elvis, Ulu & Irwin who all flew beautifully! Back in the real world… lots of photo editing has had to be done and today I had the pleasure of returning to my daughter’s school to work with the year 5 children…drawing and painting daffodils! Once again, these 9 and 10 year olds did extremely well, and this time I remembered to take some photographs of their work. 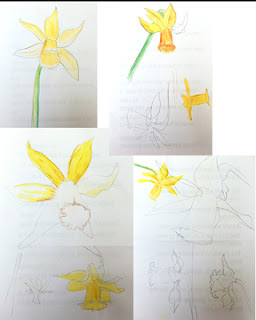 We began by making observational drawings in sketch books, moving on to a coloured drawing using water-colour pencils on water colour paper, which we blended with a damp paint brush to soften the shading. 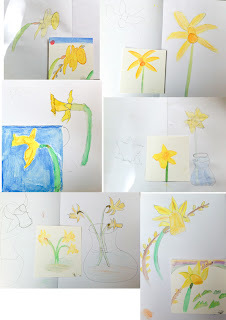 A selection of water colour pencil paintings by 9 & 10 year olds…Impressive! 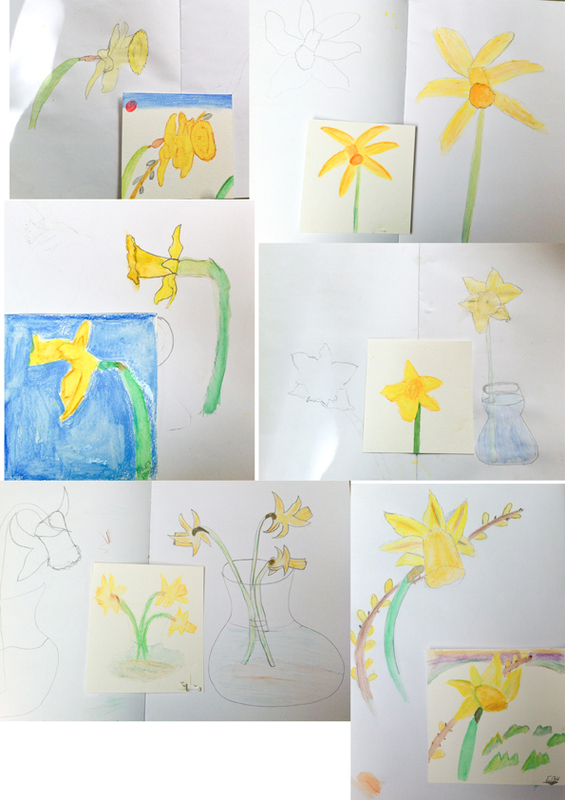 A few more works of art from year 5…WOW!! 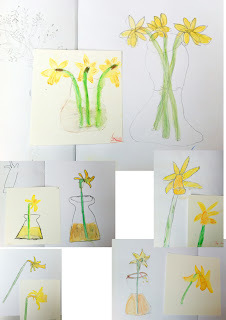 This is a series of demonstration sketches I drew for the children to illustrate the ‘crazy shapes’ made by the petals and how to blend the watercolour pencils with a damp paintbrush. 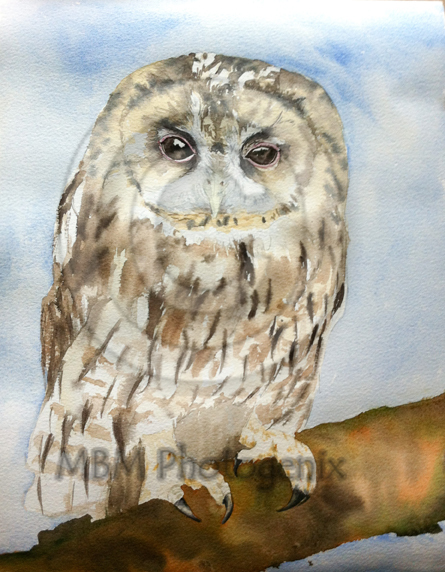 The ‘un’-finished painting…I think it needs some more work, but that was all I had time for this week! Well, that’s me done until next week..I’m of to the Big Smoke tomorrow (London) with my hubby for some well deserved R&R – I’ll be back in time for some Falconry on Saturday!!! Reach For The Stars and Follow Your Dreams! Robert Rongier on I’ve Landed At Slimbridge! Mandi on Meeting Mandy Shepherd. Carolynne Winchester on Meeting Mandy Shepherd. 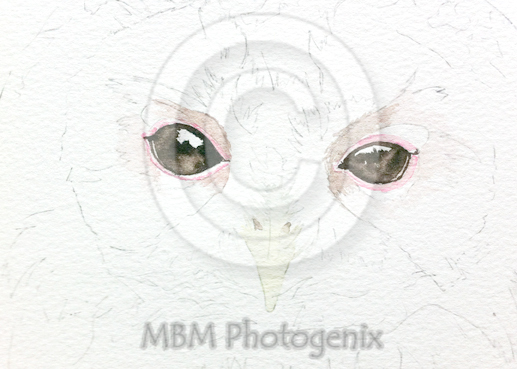 Mandi on Reach For The Stars and Follow Your Dreams!